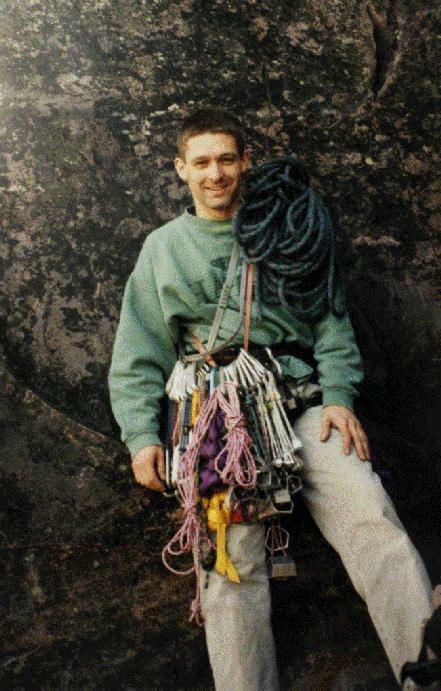 "When you struggle, feet scratching and arms vibrating on a route, he doesn't offer up the usual "yeah man, crank it," but "please, please, more elegance" as if the rock finds your thrashing disrespectful." 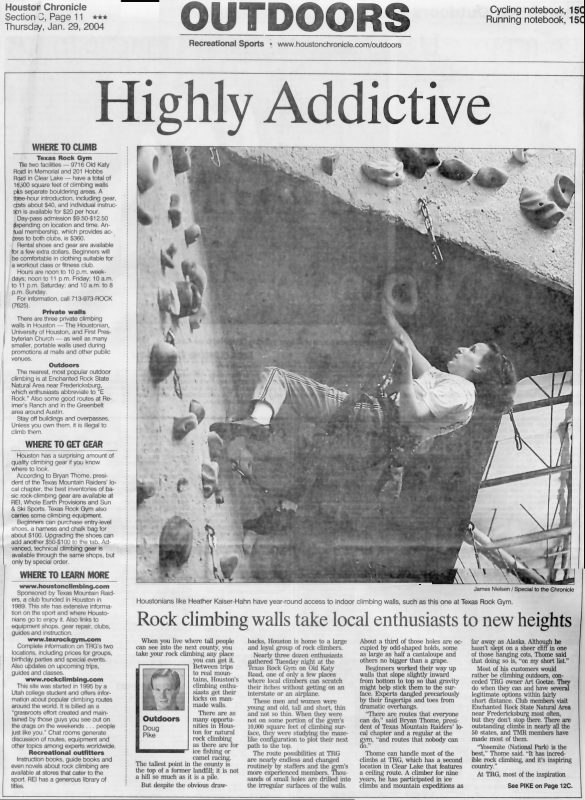 Heather appeared in the Thursday, January 29, 2004 edition of the Houston Chronicle, in an article detailing climbing in Houston. The TMR president, Bryan Thome, was interviewed for the article. 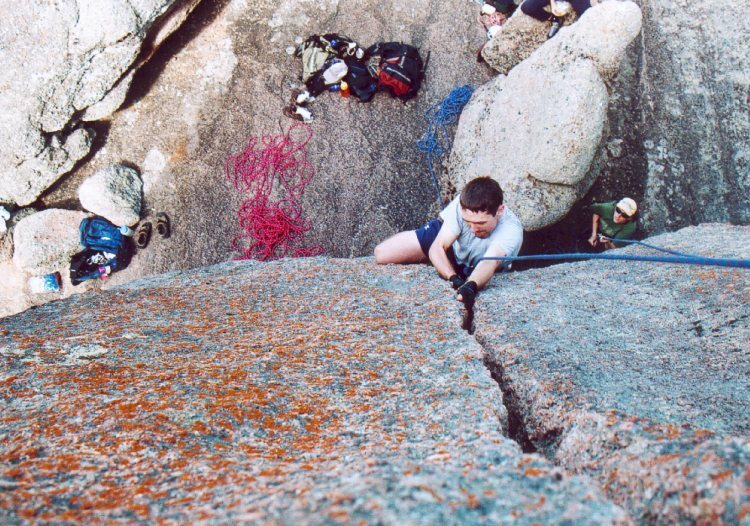 Todd trad leading Sweat (5.7), at Enchanted Rock, TX. 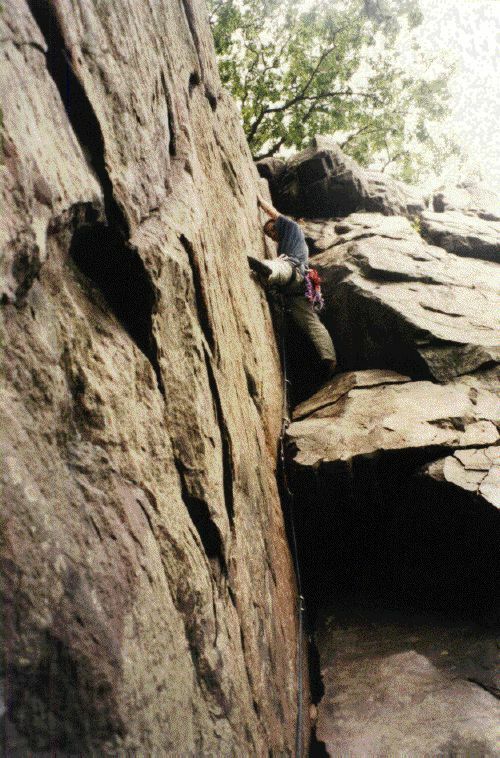 Kenosis (5.4), a fun, easy trad lead at Devil's Lake. 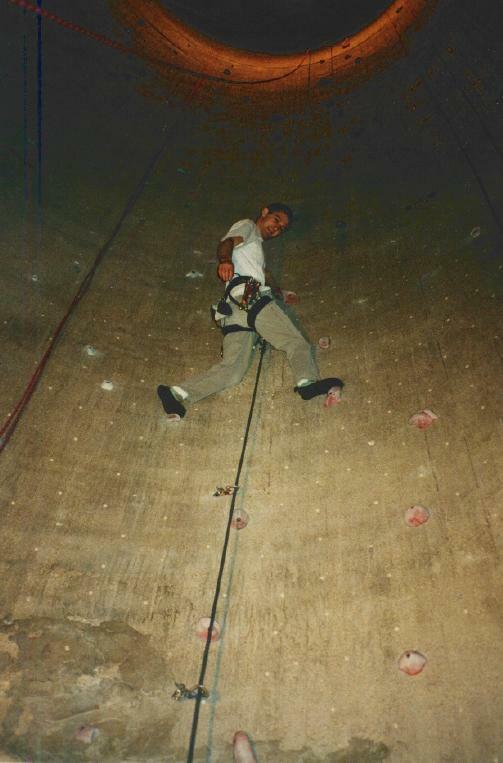 Todd silhouetted while rigging gear for a rappel. 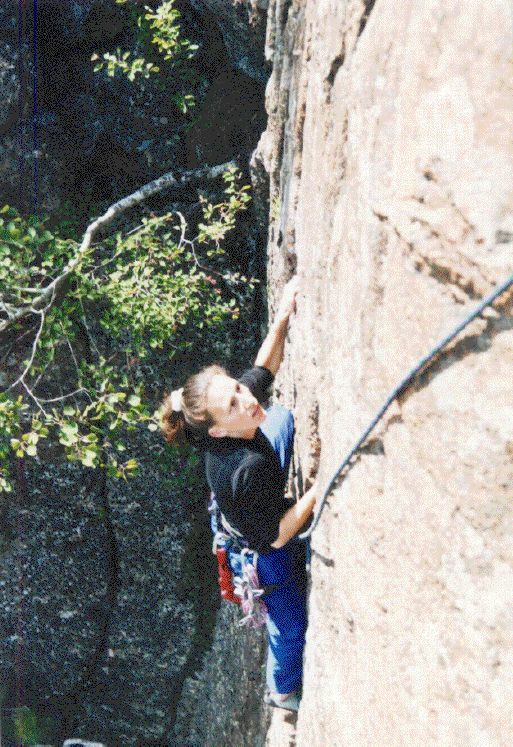 Heather placing pro in her P.J.s on Barefoot Crack (5.3) at Devil's Lake. 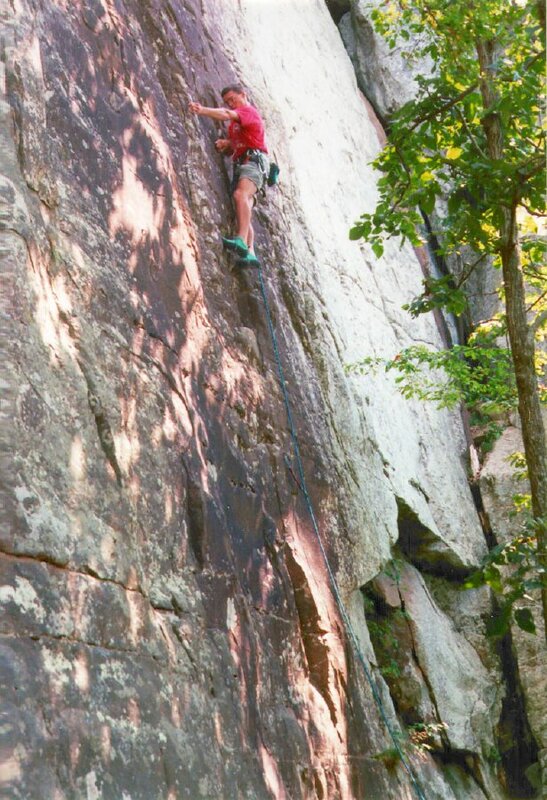 Todd starting a lead on the Breakfast Wall (5.9) at Mount Magazine in Arkansas. 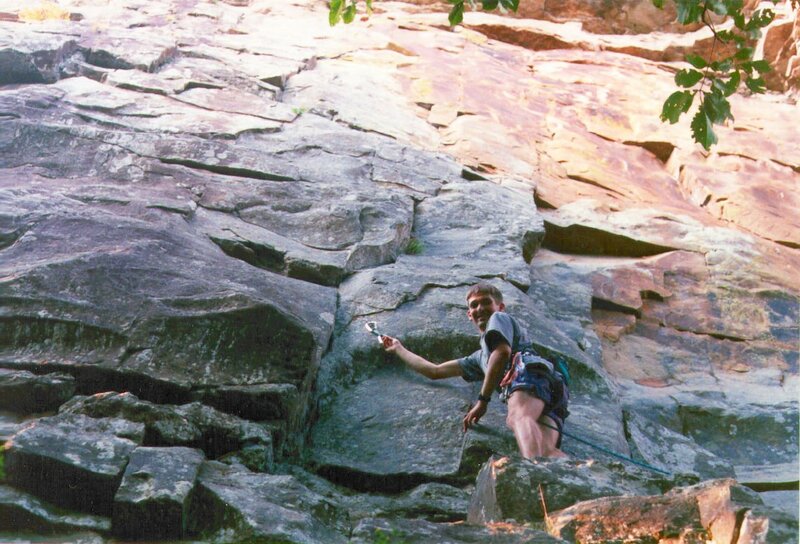 Nathan Baltz on-sighting Scarlet Begonias (5.11a) at Mount Magazine. 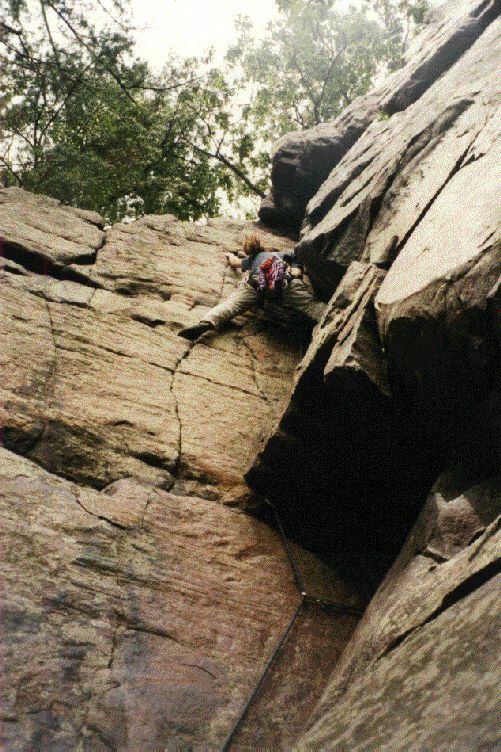 Heather doing her first real trad-lead on Levitation (5.5), Devil's Lake. 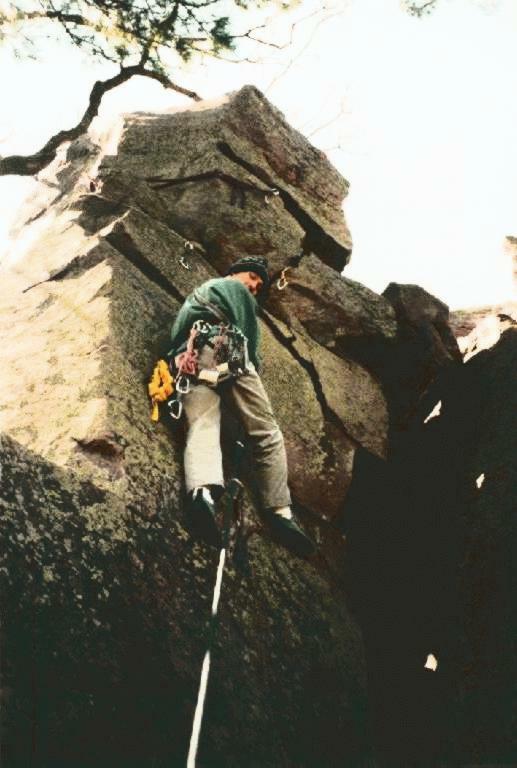 The crux is the first move, which is harder than the 5.5 rating. 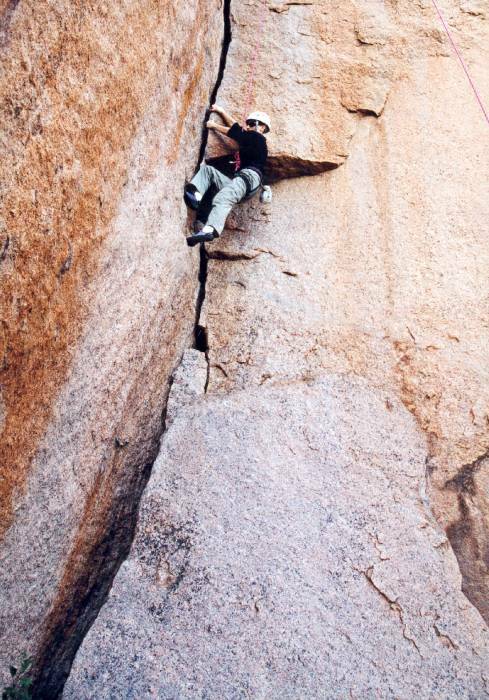 It is advisable to protect the first move by putting in a piece from the ground--there is a 10 foot drop-off right beneath the start of the climb. 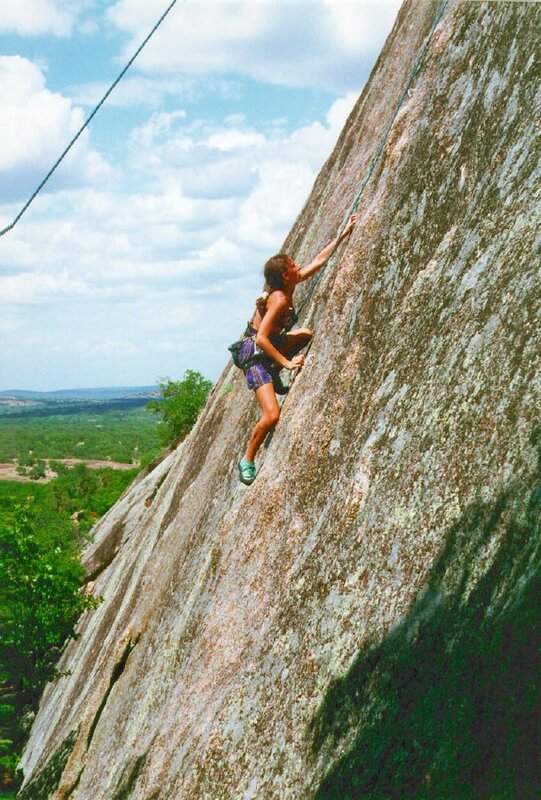 Todd on Stranger Than Friction (5.10a) at Enchanted Rock, Texas. 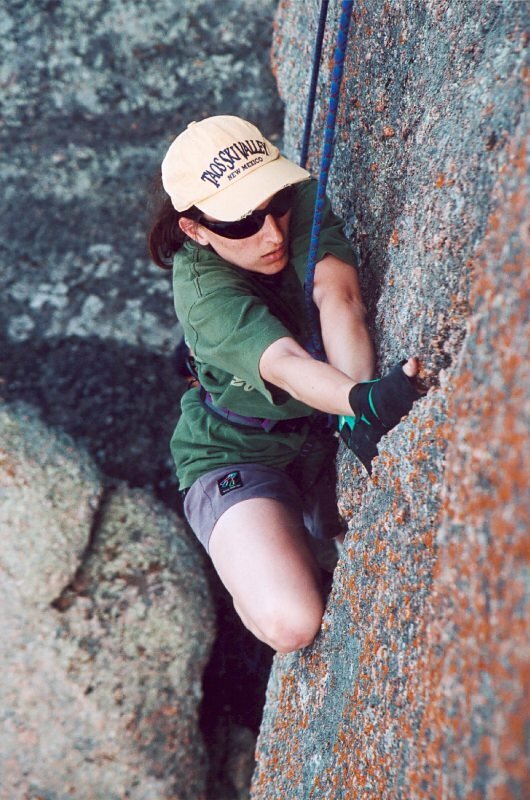 Heather on Stranger Than Friction. 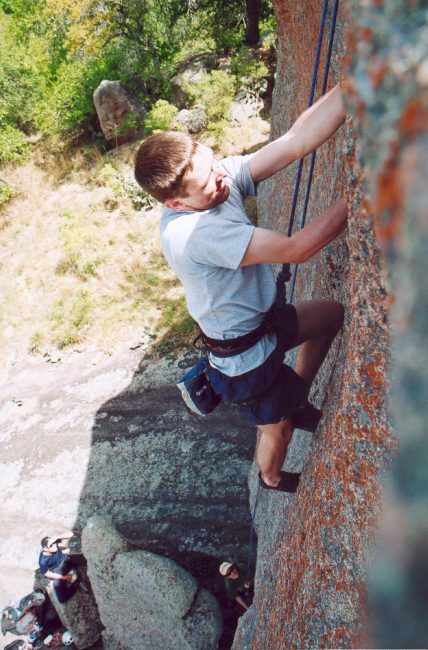 Todd at Cliff Drive, cruising up Tip Toes (5.8), Allouez, Michigan. 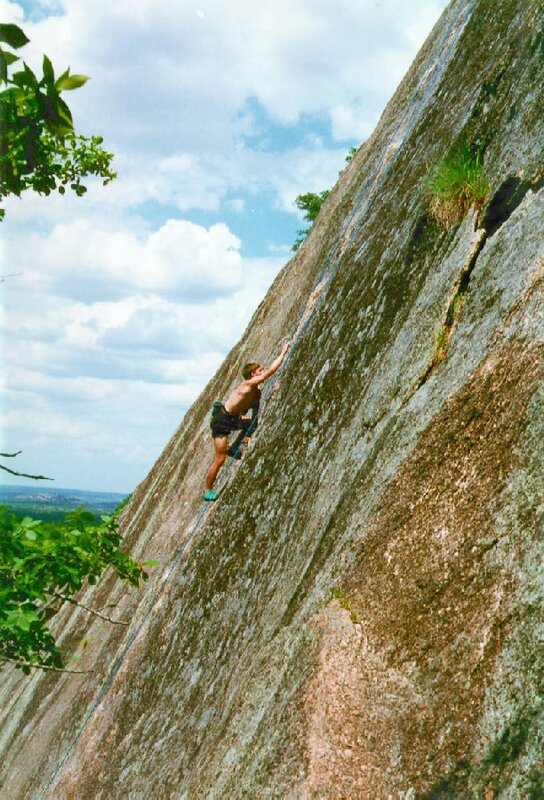 Todd on the strenuous Upper Diagonal (5.9) at Devil's Lake. 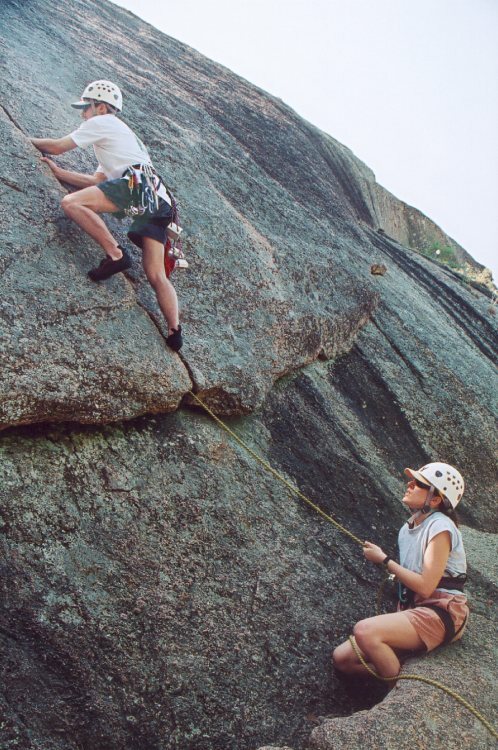 Heather on the rightmost crack of Tobacco Road (5.9), Cliff Drive. 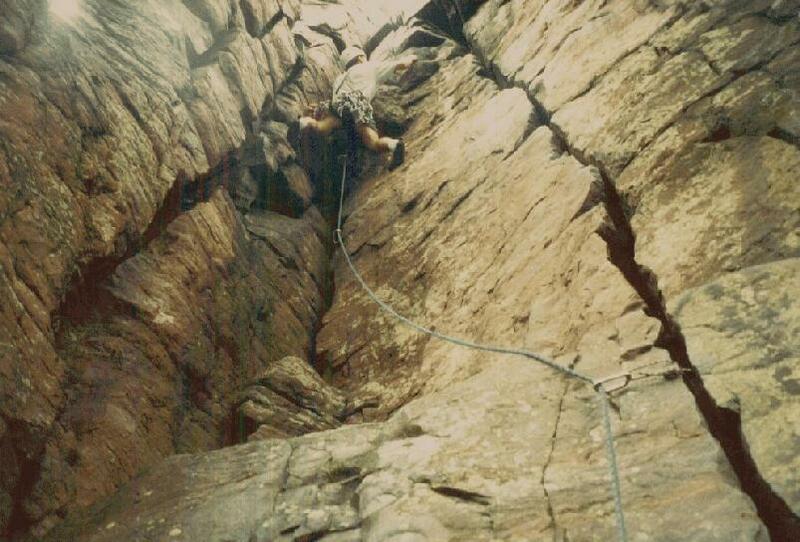 Todd on the very long J.C. Superstar (5.7), Cliff Drive. Self-portrait of Todd and Heather at the top of J.C. Superstar. 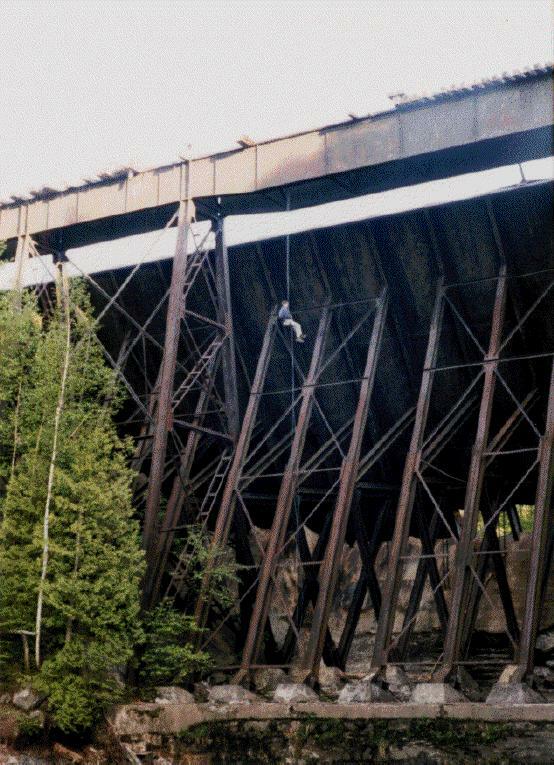 Todd rapelling off of the Redridge Dam in Redridge, Michigan. 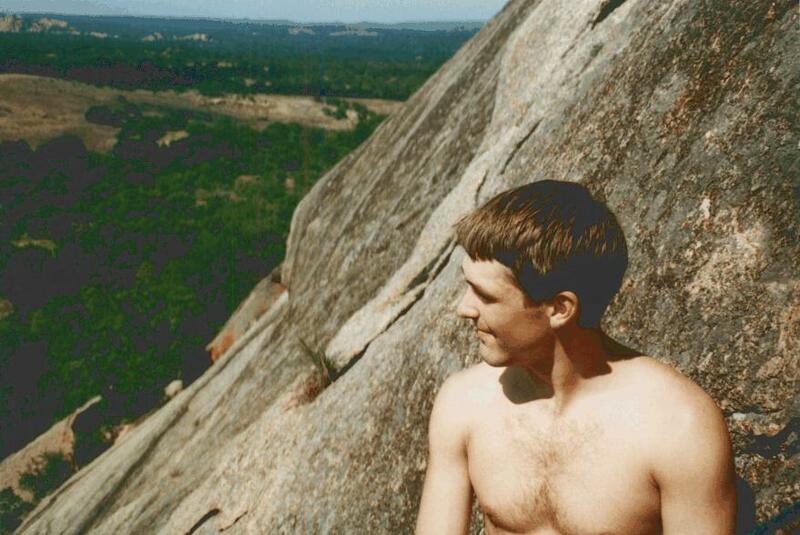 Todd at the top of the 120 foot Easier than it Looks (5.5), Enchanted Rock. 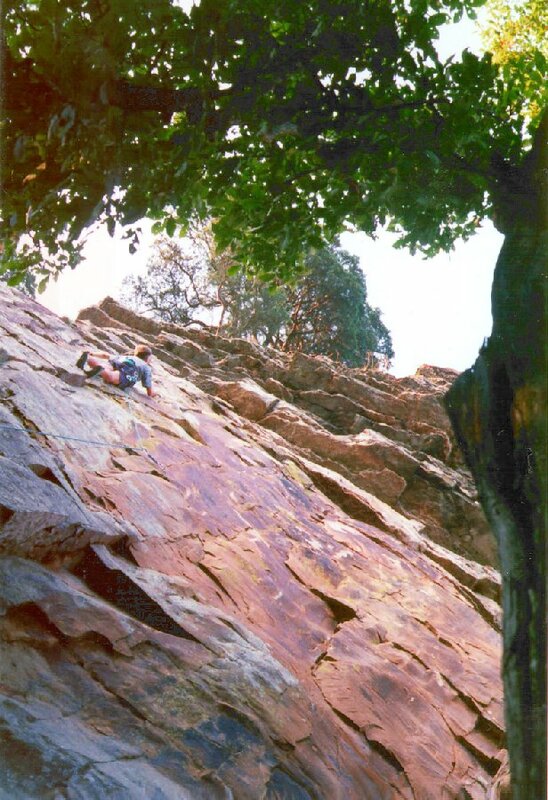 Heather led the climb and missed a bolt midway, resulting in a 40 foot run-out. 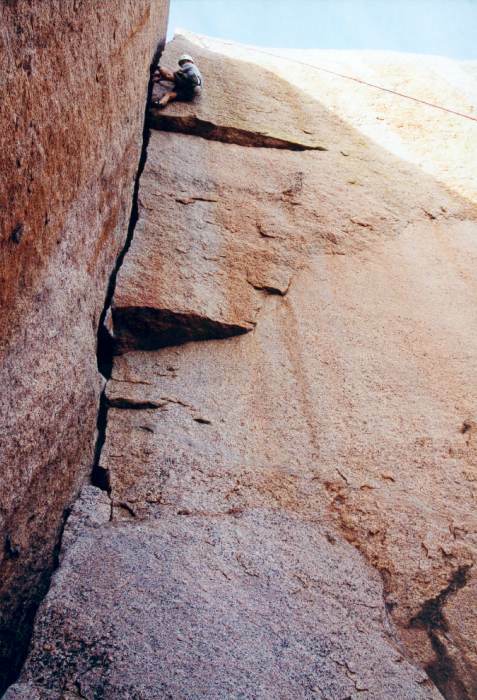 If she would have fallen, it would have resulted in an 80 foot fall. 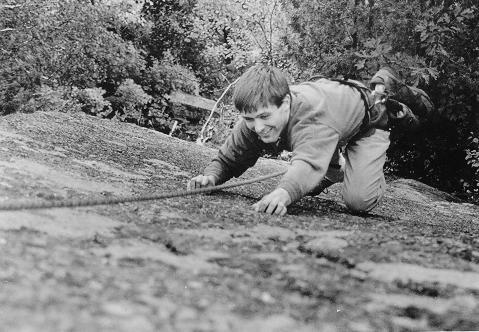 Here's where the "Edwin Moses" belay would have been useful--the belayer runs away from the wall as the leader falls, trying to take some of the slack out in hopes of preventing the leader from "decking" (hitting the ground). 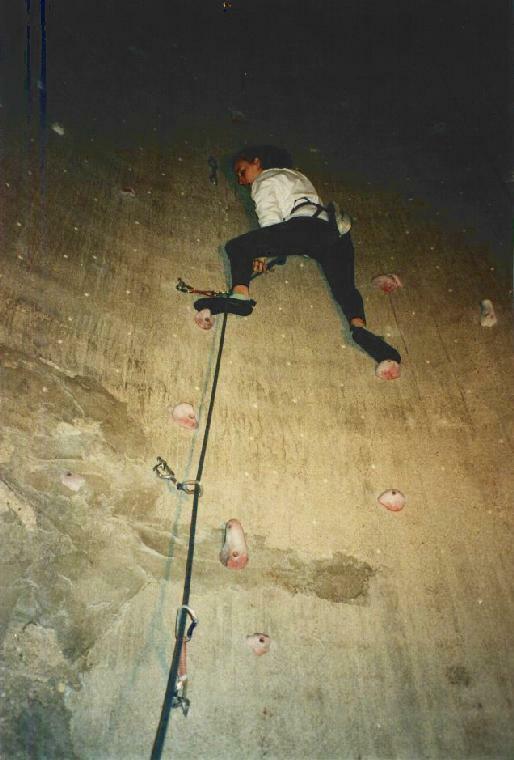 Todd at Upper Limits, Bloomington, IL. Also see my photography page. Photos by Todd Hahn or Heather Kaiser. All photos copyright © 1999-2006, Todd T. Hahn.